No Huddle Offense » Blog Archive » Distributed systems: which cluster do I obey? April 17th, 2017 • Comments Off on Distributed systems: which cluster do I obey? The topic of cluster formation in itself is not new. There are plenty of methods around to form cluster on the fly . They mostly follow methods which make use of gossip protocols. Implementation can wildly be found, even in products like Akka. Once a cluster is formed the question becomes wehter control (see this post for some background) is centralized or decentralized. Or something in between with a (hierarchical) set of leaders managing – in a distributed fashion – a cluster of entities that are actuating. Both, centralized and decentralized approaches, have their advantages and disadvantages. Centralized approaches are sometimes more efficient as they might have more knowledge to base their decisions upon. Note that even in centralized management approaches a gossip protocols might be in use. There are also plenty of algorithms around to support consensus and leader election , . Especially in Fog and Fdge computing use cases, entities which move (e.g. a car, plane, flying/sailing drone) have to decide to which cluster they want to belong and obey the actions initiated by those. 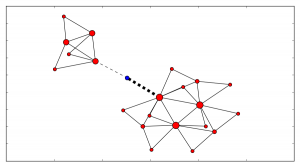 Graph representations are great for this – and yet again because of a rich set of algorithms in the graph theory space, the solution might be quite simple to implement. Note that in Fog/Edge use cases there most likely will always be very (geographic) static entities like Cloudlets in the mix – which could be elected as leaders. 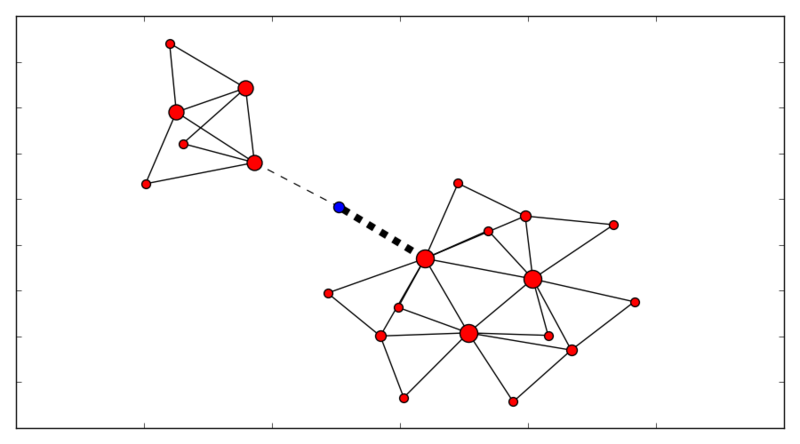 For example, the following diagram shows two clusters: The red nodes’ size indicates who is the current leader. The blue dot – marks an entity that is connected to both clusters. The width of the edge connecting it to the cluster indicates to which cluster it ‘belongs’ (aka it’s affinity). Now as the blue entity moves (geographically) the connections/edges to the clusters change. 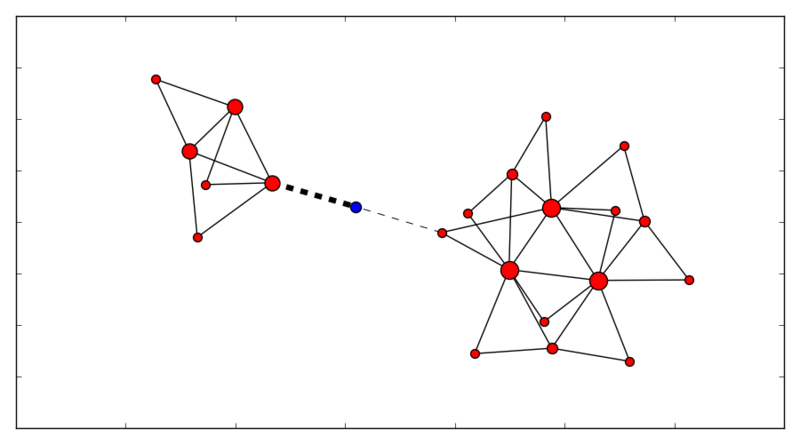 Now based on algorithms like this, the entity can make a decision to hand-off control to another cluster and obey the directions given from it.